The ASEAN Conference on Accounting Education (ACAE), held in Sunway University from 31st October to 1st November 2015 was a collaborative initiative by Sunway University and Sunway TES Centre for Accountancy Excellence together with Universiti Teknologi Mara (UiTM). Themed “Changing the Landscape of Accounting Profession: Are We Better Than Standards”, the conference addressed current issues in accounting education around the world with the aim to find solutions through vigorous academic discussions, and intensive sharing and exchanging of knowledge. YB Datuk Mary Yap officiating the ASEAN Conference on Accounting Education (ACAE) 2015. Looking on are (from left) Dr MM Nanny Dewi, Head of Accounting Undergraduate Degree Program, Universitas Padjadjaran, Indonesia; Professor Dr Rozainun Haji Abdul Aziz, Dean, Faculty of Accountancy, University Teknologi MARA; Professor Graeme Wilkinson, Vice-Chancellor, Sunway University (second from right) and Teo Ee Sing, Executive Director, Sunway College (far right). The conference was a collaborative outcome of improving accounting education after which Sunway TES being selected as the Centre for Accountancy Excellence (CAE) among the private institutions by the Government via the Performance Management and Delivery Unit (PEMANDU); while UiTM’s Accounting Research Institute (ARI) was recognised by the Ministry of Higher Education as one of the Higher Institutions’ Centres of Excellence (HICoE) among the public institutions. 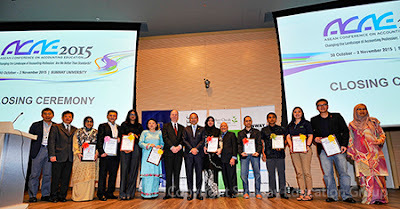 “We at Sunway are proud to be doing our bit to make Malaysia an ‘Accounting Education Hub’. We strive continuously to deliver excellent programmes to highly motivated students and to produce outstanding industry-ready graduates in the accounting and finance field”, said Professor Graeme Wilkinson, Vice-Chancellor of Sunway University in his welcome speech. YB Senator Dato’ Sri Abdul Wahid bin Omar, Minister in the Prime Minister’s Department, Malaysia with Professor Graeme Wilkinson, Vice-Chancellor, Sunway University, Tan Sri Dato’ Seri Utama Dr Arshad Ayub with the Best Paper Award winners and industry sponsors at the closing ceremony of ACAE 2015. “We are therefore delighted to be hosting this conference which has many themes of direct relevance to what we are trying to do with papers on important contemporary topics, such as the enhancement of pedagogy with e-learning, collaborative and problem-based learning, and the use of software tools in assessment. Also the conference will look at how we can build strong relationships with the profession, ensure quality and ethics in accounting education, and build solid industry partnerships,” he explained. The conference attracted a number of notable individuals from the government, academic institutions and corporate organisations who included Datuk Mary Yap, Deputy Higher Education Minister who was the guest of honour at the opening ceremony. “It is indeed great to see public and private institutions, coming together on a common platform for academic discussions, sharing and exchanging of views on current issues and methods of solving issues in accounting education around the world. With UiTM and Sunway working together and being highly committed to nation building and up-skilling efforts to bring the country’s accounting profession to greater heights, I’m sure the very optimistic that the Government’s goal of achieving 60,000 professional accountants by year 2020 can be realised”, said Datuk Mary Yap in her speech. “The theme of the conference is timely. “Changing the landscape of the Accounting profession: are we better than standards?” I hope this two-day conference will open up the landscape of the accounting profession for us to reflect and align accordingly. As such, we should be able to evaluate whether we can match, if not, we can be better than the employers’ requirements. Ask ourselves if we are following the required standards, and are we better than those standards? In so doing, ladies and gentlemen, we are forced to bring our thoughts, knowledge and expertise to the forefront to check and balance if we are on the right track, and then, further improve afterwards,” she continued. The 500 participants at the conference were those with an interest in the field of accounting education from both local and international academia, researchers, policy makers and accounting professional bodies. “The speakers at the ACAE conference will be presenting various important issues in the accounting education. We feel it is important to create a platform to address all current issues faced in the increasingly globalised world amidst the challenging economic time” said Prof Rozainun Abdul Aziz, Dean of Faculty of Accountancy, UiTM. Dato’ Sri Abdul Wahid bin Omar, Minister in the Prime Minister’s Department was the guest of honour at the closing ceremony. Among the notable speakers and panellists were Tan Sri Dato’ Seri Utama Dr Arshad Ayub, Pro-Chancellor, Universiti Teknologi MARA (UiTM); YM Raja Azura Raja Mahayuddin, Chief Executive Officer, Yayasan Peneraju Malaysia and Nor Haimee Zakaria, Chief Financial Officer, Bank Rakyat. In addition to academic discussions, the conference also discussed accounting graduates’ employability through a forum entitled “Employer’s Expectation of Accounting Graduates” by panellists from the big five audit firms namely BDO Malaysia, Deloitte, Ernst & Young, KPMG and PricewaterhouseCoopers.